I’ve been practicing information architecture since 1994, and from Gopher to Google have seen dramatic changes in the landscape of organization, search and retrieval. Through these ten tempestuous years, I’ve found the infamous three circle diagram to be a great tool for explaining how and why we must strike a unique balance on each project between business goals and context, user needs and behavior, and content. While this diagram was conceived with IA in mind, it’s equally useful for explaining UX. 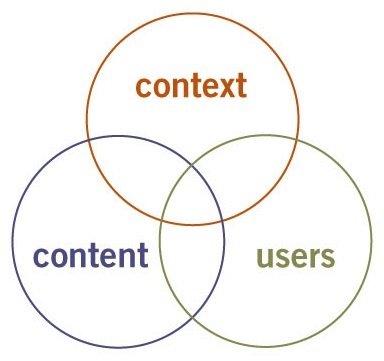 In conjunction with Jesse’s masterpiece, I use the three circles to illustrate the distinction between user experience and user-centered design. I’m still not convinced UCD exists outside the realm of theory, but I practice user experience design every day. Naturally, the jump from three circles to seven hexagons gave me a buzz, but after months of road testing, I can safely say this diagram has survived the honeymoon. For example, I realized some time ago that while “information architect” describes my profession, findability defines my passion. Since then, I’ve found my focus on findability has opened my eyes, leading me beyond IA while simultaneously making me a better information architect. Last Summer, while redesigning the Q web site, we identified findability as a top priority. Our quest to make this small site more findable took me beyond the discipline of information architecture and deep into the realm of search engine optimization. That experience proved useful last Fall, during a redesign project for the National Cancer Institute, in which we used findability concepts and SEO statistics to alleviate an unhealthy fixation on the home page, raising awareness of the need to design findable documents for direct access via the Google, MSN, and Yahoo! search engines. Though the findability audit was a success, it did feel ironic to once again be ensnared inside a box (or hexagon) of my own making. But I’m sticking with findability for now. Between my new seminar, my new book, and findability.org, I’m busy as a bee. 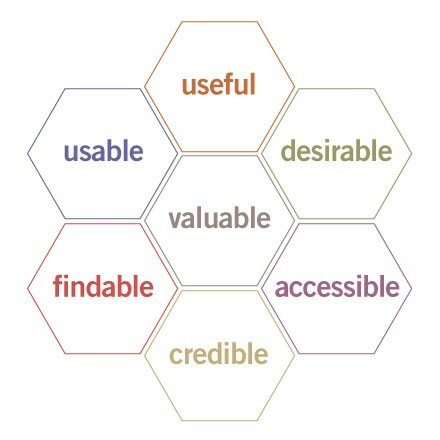 And anytime I feel trapped, I can explore other facets of the user experience honeycomb, or perhaps even create a new diagram. For me, user experience design is a big hive: a dynamic, multi-dimensional space where there’s still plenty of room to build new boxes and draw new arrows, at least for the next ten years. How to Plan for Design (and Why) Article by Peter Morville.